In simple straightforward language, Dr. Boone has set forth important reasons for teaching anatomy in the exercise physiology curriculum. He believes that the students of exercise physiology cannot do their best in prescribing exercise medicine without an understanding of anatomy. This is especially true when it comes to flexibility training. Anatomy: A Pressing Concern in Exercise Physiology presents the first-ever anatomical background to why there are good, useless, and dangerous flexibility exercises. Dr. Boone believes that without anatomy as part of the exercise physiology curriculum, exercise physiologists will continue to engage their clients and patients in useless and dangerous flexibility exercises. The result is a failure to increase their range of motion, a waste of time in achieving increased flexibility, and the possibility of damage to the muscles and joints. Such a practice is similar to prescribing exercise medicine without an understanding of exercise duration, frequency, intensity. While it is possible that the students of exercise physiology can learn anatomy without hands-on dissection, it is not the desired approach. That is why Dr. Boone developed an Anatomy Laboratory with cadavers that were dissected by his students at Wake Forest University in Winston-Salem, NC, the University of Southern Mississippi in Hattiesburg, MS, and the College of St. Scholastica in Duluth, MN. This book explains that we must close the door on yesterday’s views of “what is exercise physiology” and keep it closed. We live today, not yesterday. We are healthcare professionals who prescribe exercise medicine to prevent and treat chronic diseases and disabilities. This book is a big step into the 21st century commitment to the professionalization of exercise physiology. For years the kinesiology course was the anatomy course in the health and physical education degree. Now, although students can still major in health and physical education, the title has changed in many academic institutions to exercise science, kinesiology, and numerous other degree titles. It is no secret that exercise physiology grew from this academic background of athletics and exercise in health and disease. Today, exercise physiology is increasingly recognized as the new 21st century healthcare profession. While exercise physiologists are educated to prescribe exercise medicine from a physiological perspective, there is the concern that they need an anatomy course to fully understand the depth and implications of flexibility training. 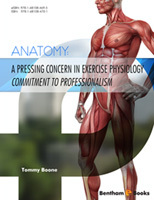 This ebook, Anatomy: A Pressing Concern in Exercise Physiology, is the opportunity to promote the academic importance of anatomy as part of the professional development of exercise physiologists. It describes in detail the anatomical reasons for the good, useless, and dangerous flexibility exercises. Without question, academic exercise physiologists should teach anatomy to the undergraduate and post-graduate students, and the students should have the same opportunity as other healthcare students to study cadavers to grasp the significance of the musculoskeletal system. The hands-on laboratory opportunities will help the students of exercise physiology to safely prescribe exercise medicine and to work as a professional with athletes of diverse sports. This work should also encourage the support and recognition of the ASEP Board Certified Exercise Physiologists as healthcare professionals. The author confirms that author has no conflict of interest to declare for this publication.